There's Nothing Trivial About Pygmy.. I believe the pygmy forest is a rare and valuable resource and should be protected. Passionate advocates have devoted years of their lives to preserving pygmy forested areas in Mendocino County. Professors, students and scientists have studied and written about the pygmy forest and it is a serious business for me. There is however a lighter side to this. While Skimming through dozens of pygmy forest related geology, botany and conservation documents I have run across pygmy "things" that are just asking to be looked at no matter how irrelevant they seem. Therefore, I'm taking a break from serious exploration for a bit to concentrate on some of the things that are not necessarily related to the "pygmy forest" but caught my attention anyway. It is time to learn some pygmy trivia. eager in their hearts to protect one another. Homer doesn't describe his pygmies or the nature of their conflict with the cranes. It is clear that notions of pygmies were common in Greece 2700 years ago. Over the millennia a sizable body of art and literature has developed, with detailed depictions of the weapons used by pygmies, the way they rode into battle and the houses they lived in. The ancient "Wars of the Pygmies and Cranes" is well known to scholars & historians and remains alive at the hands of writers, poets, artists and others. Jonathon Swift, Nathaniel Hawthorn, William Shakespeare, Henry David Thoreau and J. K. Rawlings are only a few of the authors who have employed dwarfs, pygmies or other little beings to further their literary messages. About 350 BC Aristotle wrote, "A History of Animals" (Book VIII, part 12), wherein he cites Homer's work to assert that the Cranes migrate annually to Upper Egypt to war with the pygmies. He also contends that the pygmies rode miniature horses into battle and lived in caves. Museums house a variety of Crane-Pygmy battle scenes on pottery, mosaics and other relics illustrating how wide spread and enduring this story was. About 300 AD, Greco-Egyptian writer Athenaeus of Naucratis further expanded the legend by adding that partridges where in league with cranes against the pygmies. His contribution appeared in "Deipnosophistae", a book which I can only describe as a "self help" guide to making intellectually stimulating dinner conversation. 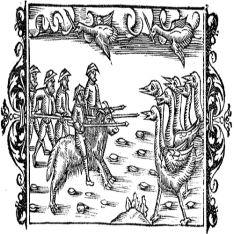 Sixteenth century Swedish author Olaus Magnus, in his "History of Northern Peoples", has it that dwarfs in Greenland waged war against cranes. Egyptian, Musa Ud-Damiri echos a similar story in his Hayat al-Hayawan (The Life of Animals), a compilation of information from over 500 writers and 200 poets, in which he treats, in alphabetical order, the 931 animals mentioned in the Qur’an, although his pygmies lived on an island and most of them were missing an eye from previous run-ins with sharp billed cranes. The story is also familiar to the pre-civilization New World. According to an American Indian story, some Cherokee youths once traveled south until they reached a land of very small people, about knee high. They were said to be puny and lived in constant fear of wild geese and other birds that migrated from the south to wage war on them. The word pygmy is derived from the Greek "pygme", a unit of measurement from the elbow to the knuckles. In folklore and fantasy pygmies take on every manner of small-fry being including dwarfs, trolls, hobbits, fairies, midgets, leprechauns, goblins, gnomes, imps, elves, gremlins, midges, hobgoblins and scores of others. Some are notably benevolent like Tinkerbell and your own Fairy Godmother, some are mischievous such as Leprechauns while other are treacherous and cruel – think of the Troll under Billy Goat Gruff's bridge or Rumplestiltskin. 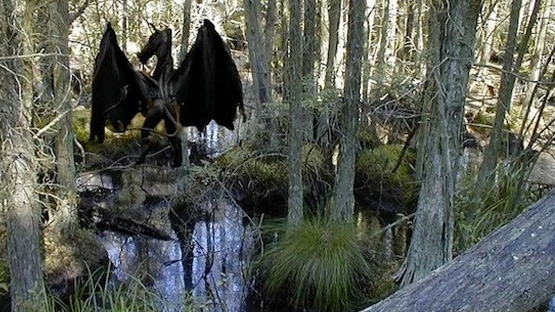 Among these is the Jersey Devil of the Pineland Barrens and it's pygmy forests. This devil comes to life in a story about a woman, who, upon learning that she is pregnant with her 13th child, declared "This one will be the devil!". Born as a normal child, it changed to a creature with hooves, a goat's head, bat wings, and a forked tail. Growling and screaming, it killed the midwife before flying up the chimney, circling nearby villages, and heading toward the pines. The NHL team named "The Jersey Devils" is a tribute to that woman's child, as it continues to haunt the pygmy forest. The word "pygmy" is well worn and tested to evoke a reaction. There are pygmy animals, pygmy people, pygmy places, pygmy things and even pygmy insults. There is scant literature about pygmy thoughts or pygmy feelings but I believe they are as real as the Pygmy Hippopotamus. Wars between the pygmies and the cranes were not the only pygmy wars. The wars of 1918 – 1923 in Eastern Europe and Russia were called the pygmy wars, so dubbed by Winston Churchill as he foresaw the conflicts looming after WWI. He said, "The war of the giants has ended; the wars of the pygmies have begun." There are pygmy elephants in Africa and Asia, Pygmy kangaroos in Australia, pygmy antelope & Jerboa, – Bumblebee bats, Pink Fairy armadillo, and the oxymoronic pygmy whale and pygmy mammoth. There are Bumblebee hummingbirds in Cuba who use spider web silk to attach their nests to small twigs and the Etruscan shrew, the smallest mammal in the world. Miniature domestic animals include 17” horses, tea-cup pigs, toy dogs, Munchkin cats, miniature cattle, Pygmy goats and Dwarf rabbits. 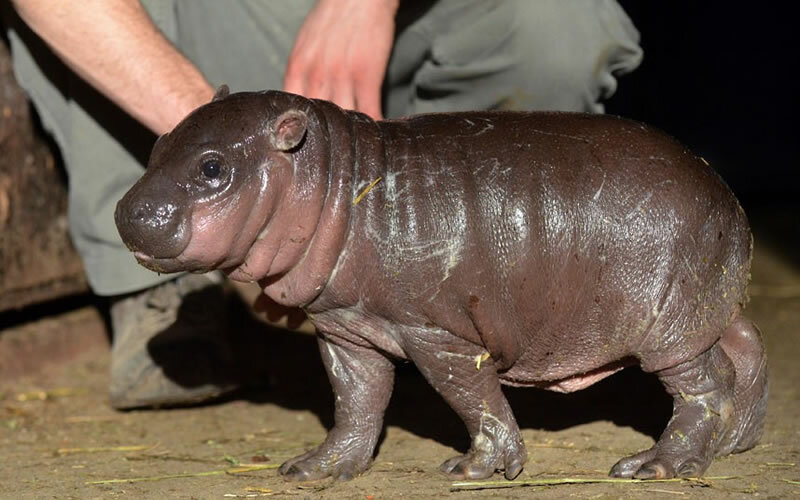 Baby Pygmy Hippopotamus There are about 200 species of animals designated as "pygmy". A gallon of average fat milk weighs 8.6 lbs., but Pygmy Goat Milk weighs only 8 lbs. because it is leaner. 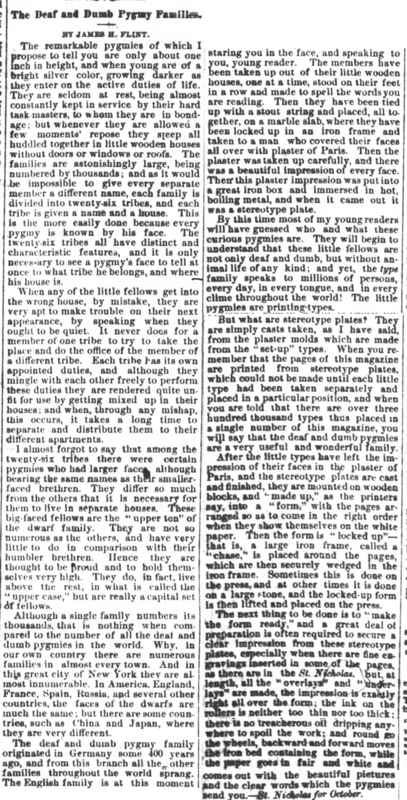 I recently counted the number of articles in which the word "pygmy" was included in the newspaper archive that I use for research. 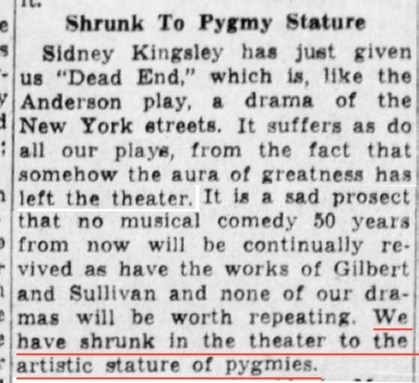 Between the years 1700 and 1750, "pygmy" appeared in 7 articles. 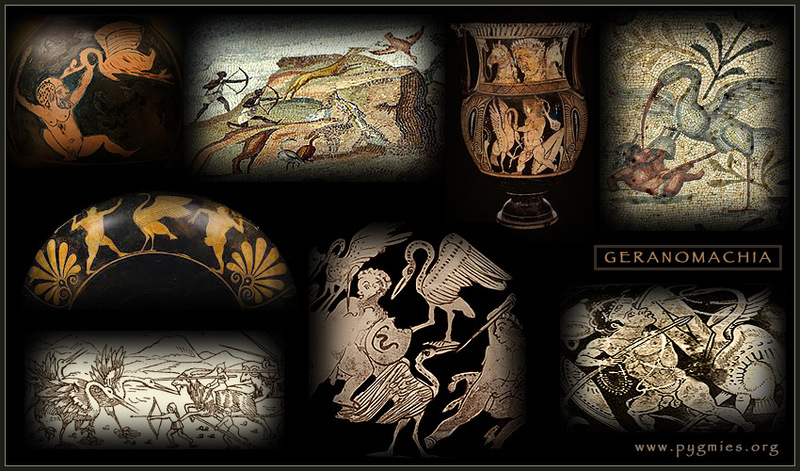 The term was mostly used as an insult except for a single reference in an ad for the reading of a poem about Homer's mythical battles between the Pygmies and the Cranes. The next 50 years brought up 9 articles with the word "pygmy", all tributes to "Pliny the Elder" of Roman times and the mythical pygmy-crane wars. 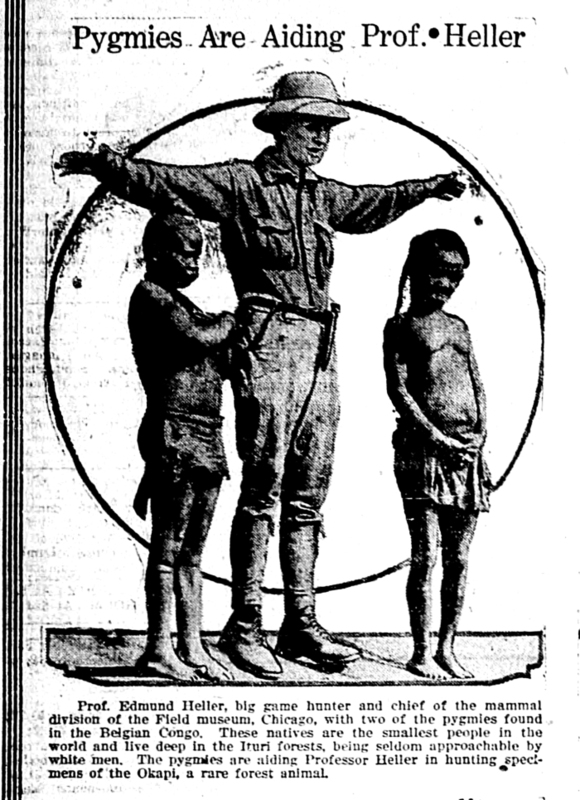 Between 1800 and 1900 almost 4000 stories appeared in the newspapers about pygmies. Most of these were about African pygmies who had recently been discovered. A fictional story about 8 inch tall pygmy children playing under the shade of mushrooms and living in tiny cities was widely circulated early in the 19th century which clouded any understanding of what real pygmies were and further relegated them to the realm of fantasy. An 1874 children's story, "The Deaf and Dumb Pygmy Families", was written in the form of a riddle, where the pygmies turn out to be printing press type of various fonts. The next 50 years saw twenty six thousand pygmy articles including many contradictory stories about the nature of pygmies. Some articles stated that they were deceitful and treacherous cannibals while others depicted them as warm, friendly and generous, although of limited intelligence. All agreed that they lived like animals in dark and isolated "pygmy forests". Since 1950, over sixty eight thousand such stories have been written. Actual Pygmy Forest stories, about the kind of forest that consists of stunted trees, were published in 508 articles over the entire 300 year time-period. I am inadequate to address the magnitude of problems pygmy tribes and people have confronted in regions of Africa for countless generations. They have been marginalized, ridiculed, displaced and exploited at almost every turn in history. There are descriptions of them being used as servants in ancient Egypt and as side-show subjects in 20th century America. They have been hunted down for sport. They have been captured to be put on display for Kings in Europe and they have been measured, weighed and inspected by anthropologists and museum curators. It cannot go unmentioned that stories about pygmy people in Africa persist in the news. They live in peril in the Democratic Republic of Congo, their existence threatened by deforestation, prejudice and enslavement. One champion of the Pygmies' cause is professional mixed martial artist, Justine Wren, who traded a life of drug addiction and despair for a home in Central Africa with the forest people that he loves. An Ugandan pygmy hunts monkeys in Semili national park in Bundibugyo district. Many of these people, living in the African wilderness, call themselves "forest people" because the forest is integral to their livelihoods, identities, and history. Bakoya, Bakola, Baka, Badzan and Aka are some of the ethnographic ways they are identified in their home countries. Some live traditionally, far from civilization, taking their sustenance, entertainment and medicine from their native rain forest environment. Many, however, are living at the end of time as they are displaced by outsiders for a variety of reasons. Their forests are being logged by multinational corporations to take profits from the "dark continent". Cattlemen and farmers are quick to claim newly cleared acres to grow palm oil and corn for western markets. Mining camp hunters take more bushmeat from the forests than can be sustained to fuel the extraction of coltan, a rare earth metal essential for the manufacture of cell phones. Well intentioned ecologists from Europe and America, seeking to preserve undeveloped rain forests have evicted hundreds of these people. "Neither make Choice of a Dwarf or a Fool; for by the one thou shalt beget a race of Pygmies and by the other will be thy continual Disgrace; and it will hurt thee to hear her talk: For thou shalt find it to thy Grief, there is nothing more fulsome than a She Fool." I'm not absolutely sure what this phrase means but I don't believe it's meant to be complimentary or praiseworthy. In 1919, U.S. Senate Majority Leader Henry Cabot Lodge Sr. (R-Mass.) called Democratic President Woodrow Wilson, who he had feuded with over the ratification of the Treaty of Versailles, "the most sinister figure that ever crossed the country's path." After the Treaty failed to garner the requisite two-thirds vote in the U.S. Senate, Wilson referred to Lodge and other opponents of the Treaty as:"Pygmy minds." In a private diatribe that left listeners stunned by its vehemence, U.S. president, George W. Bush, called Kim Jong Il a "hateful pygmy" who behaved like "a spoiled child at a dinner table." Newsweek May 19, 2002 . This statement turned out to be more insulting to Pygmies than to Mr. Kim. Pygmies have long been angered by this type of denigration. There have been a number of things given the name "pygmy", presumably to instill a pygmy aura or pygmy attribute to these items. Of the hundreds of pygmy things I have been offered this week, my favorites include Yshoot Sport ARC Carbon Fiber Pygmy Bow Walking Stick with Bow and Arrows, Complete Set - ART0092 for only $199.95, (and it's made of carbon fiber in France so connoisseurs should love it), and the Pygmy titanium micro-tool which was designed by someone who makes tools for brain surgeons. This little beauty, weighing the same as a quarter, is a Phillip head and flat head screwdriver, a scraper and and a 1/4” nut driver for only $28.00. It could be called "Pygmy Ikea Pet". The Pygmy titanium micro tool project has raised $9,191 on kickstarter to date. effort to win a sweet production contract, the Ford GP "Pygmy", was one of them. The term "Pygmy" means different things to different people depending upon where they first heard it and in what context. The meaning can be fortuitous and delightful or mean and detestable. It is almost never complimentary yet it is often endearing. As I think about what the pygmy forest means to people and why many people's first experience of the pygmy forest is disappointing, I can't help but consider all of this cultural, historical and literary data and how it has shaped peoples expectations. 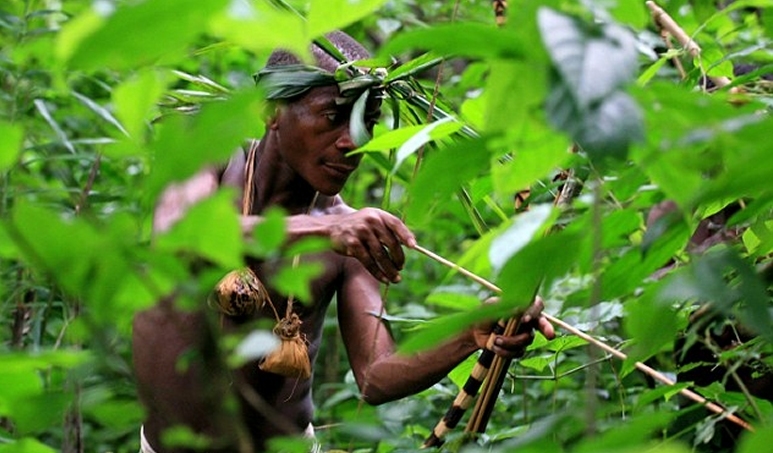 Coming Soon: Would You Let Your Child Play In The Pygmy Forest?